The first OVA continues one of the unresolved plotlines from the 62 episode Hunter x Hunter anime. Kurapica finally reveals to Gon, Killua and Leorio the reason why his nen abilities are so high along with the restrictions on it. He thinks his reason for revenge is done, but it is not - the Spiders are still alive! This OVA focuses on Kurapica's unending quest to avenge his "dead" tribe. Similar to Hunter x Hunter, the art is good but nothing special although it does continue in the same vein as the original anime so viewers will be used to it. The soundtrack reuses a lot of themes that we're familiar with from the anime also. It's hard to review this OVA without going into spoilers, but here goes! The story is wonderful! In my opinion this is the best story among the 3 OVAs. There are twists and turns galore. Added to which the cast of the spiders is amazing - here are bad guys you really want to find out more about. The ending was also ... a surprise! It was a fitting resolution but it leaves the possibility for further plot development open. Every other episode I find myself thinking "Wow, now THAT is a gifted writer" (who wrote the manga) as he managed to pull together everything perfectly - the pacing, the character development and plot twists! If you enjoyed Hunter x Hunter you won't want to miss this. As a continuation of the first series, you can expect the OVA to fill in much of those undesired loose ends and plot holes that cropped up throughout the series. These episodes focus on Kurapica's quest for revenge and his eternal hunt for his clan member's eyes. Fans of the original series will note that Hunter x Hunter is not a terribly fast-paced anime, and tends to build the story around the characters and their interactions with one another, rather than with action. It lures the audience in by showing them all the interesting depths of the characters -their goals, their dreams, their struggles- and makes us root for them when they hit dirt. This OVA does so much more than that. Following up on the hints we were given with the original series, the OVA gives its audience a much deeper look into Kurapica's emotions and hardships, while also managing to show the heartfelt friendship between him, Leorio, Gon, and Killua. Kurapica's character, I feel, was for the most part just a supporting character originally and wasn't given too many layers that really fleshed him out and gave the audience much insight into his emotions. Suddenly this problem is completely rectified: he becomes so much more of a main character than I thought he could be, he shows new and interesting sides of himself that I didn't know existed, and he draws you into loving his character so much more so than before. Furthermore, the OVA builds on his friendships and shows the trust, loyalty and support between them. The Spiders are given stronger personalities and I feel they are much rounder characters than they were before. 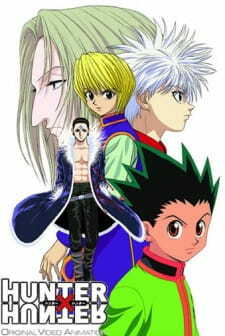 Each one has a unique relationship with each other and with Kurapica, and you really start to play favourites as he lays out his plan to dissolve the organization. All in all, for me character was a 10. The story is these episodes is a bit more fast-paced than what fans are used to (which is a given considering the number of episodes). However, this is what I found so exciting in this OVA. There's a lot of mystery in this plot, and Kurapica's planning skills with his limited number of resources is superb. Just when things start to fall apart, he critically analyzes the situation and pulls everyone through the trouble. I love all the problems Gon and Killua run into, and those two pulled a few stunts to get through them, even surprising many of the Spider members. I must say without a doubt the story was a 10. As far as art goes, I didn't notice a whole lot of difference between the OVA and the original series. The lines could be cleaner, but that's probably just my preferance rather than the quality of the art. To me it wasn't bad: 8. For sound, in terms of music: it wasn't spectacular but it wasn't terrible either. The opening and ending themes definitely aren't the best, I would say they were average. Background music and sounds were acceptable (but it isn't shinobi battle music, if that's what you're expecting). 7/10 for sound. This OVA is everything you were expecting and more. This review is for anyone who has seen the original series before the original. On the insistence of a friend, I binged the new series. I became addicted and went back to finish the originals, and here I am. All I have to say is: if you're here after watching the original series and liking it, you're not going to be disappointed. The Yorknew/Phantom Troupe Arc is easily one of my faves, so perhaps this is a little biased. However, it's hard to refute the fact that the plot is anything but well-written. The story is structured in a genius way where all logic is addressed and cleverly worked around without overpowering any character or group. Everything is painfully realistic, making any victory by the protagonist even more satisfying. In addition, it's fast-pasted enough that it's captivating but not so fast that it's difficult to follow. On the other hand, the art has clearly evolved since this was made, but it's not like the art takes anything away. It's easily evident how much effort was put in into animating this OVA; it's apparent in every aspect, really. There were some moments that took my breath away despite it being old and 'grainy' animation as some refer to it. The background music is all very impressive, but I wasn't a very big fan of the opening. In fact, I personally feel like it took away from the profound and vengeful feel of this arc. Oh boy, the characters are easily some of the best I've seen in anime. They are complex with varying sides to their personalities, flaws, and strengths that make them feel like real people. Even if you have seen the reboot, this is still a must-watch. I, for one, will never get tired of seeing Kurapika's efforts come to fruition as he takes out his anger. Especially with the complexity of his character, it's really a spectacle to see. Overall, you will not regret watching this, even if the reboot is adapted almost exactly. It's a phenomenal series without a single dull moment. i get right to it...because i have no time to waste got to go watch the other OVA asap. STORY-this was amazingly brilliant.it didn't felt like a OVA at all and i love that feeling.we had lot of unanswered questions left hanging in the series well look no further it will be solved right here right now.this 8 episodes felt so intense because right at the beginning everything was like a chess game who had their knight,queen and king on their side and how to use it for their advantage.when both sides make their plan,their CAT AND MOUSE CHASE BEGINS and it gets so exciting filled with all information that where left out your heart will start to pound faster and BELIEVE ME YOU WILL FORGET TO BLINK. CHARACTERS-we get to see out favorites in action in none stop drama with a pinch of comedy and there are surprise guests that will make the plot twits that will keep you guessing until the very end you get to see hisokas excitement for the full extent :3 i wont say more. SOUND-was superb as expected it makes it more fun and get you on the mood to the action that is about to come,great job,was true to it self to the very end.